He wouldn’t give me ten percent an inch…..
Former Malaysian prime minister Mahathir Mohamad says the late Mr Lee Kuan Yew was “kiasu” and wouldn’t budge on negotiations. This was because Mr Lee’s relationship with Malaysia was “coloured with bitterness” over Singapore’s expulsion from the federation in 1965, Dr Mahathir said. “We had 20 problems to resolve and I spent 22 years (as prime minister) trying to resolve them, but I could resolve none. He will not give even an inch; kiasu, you know,” Dr Mahathir, who served as Malaysia’s Prime Minister from 1981 to 2003, reportedly said to students at a dialogue in Cyberjaya on Saturday. Asked why Malaysia was not as well-developed as Singapore, of which Mr Lee served as the founding prime minister, Dr Mahathir replied that the smaller country had fewer problems to deal with. “They don’t have to build many roads. They don’t have racial problems. We have racial problems. And they can forget about the minorities and do what they like,” Dr Mahathir said, according to news portal Malaysian Insider. Dr Mahathir also denied being an authoritarian leader, as he had relinquished power. Mr Lee, he added, was different. “Which authoritarian ruler resigns? Can you tell me?” he asked. 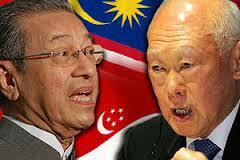 “Lee Kuan Yew resigned as prime minister but he was still in the government as senior minister and minister mentor. I left completely and I don’t want to come back,” he reportedly said. The dialogue was organised as part of a global leadership series for youth. Last month, Dr Mahathir had expressed sadness over the passing of Singapore’s founding father, although he said he was not a close friend of the late leader. The former Malaysian leader also said he “crossed swords” many times with Mr Lee after Singapore joined Malaysia in 1963, but “there was no enmity”. Mahathir has been called by certain quarters as `Mr Ten percent’ for allegedly demanding a ten percent cut on any government projects awarded to contractors, an accusation which he has always denied.